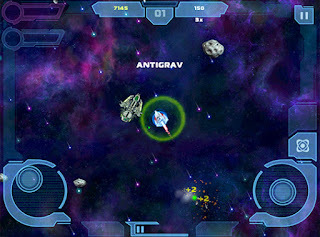 Released in February of 2012, Asteroids: Gunner is a remake of an Atari Classic. When talking about Atari arcade games and the iconic Atari 2600, Asteroids is always at the top of the list of most popular games. In our first installment of Atari Archives, we at Atari Edge felt it was only right to start with this remake of this legendary classic hit. Asteroids: Gunner is only available for Apple iOS devices, and during our testing, we found that it is not compatible with iOS version 11. We were able to to test it on an iPad running iOS version 9.3.5. Though the basic concept of blasting asteroids is the same, from the start of the game, Asteroids: Gunner has a distinct feel to it. With it's social features including the mobile social gaming network OpenFeint, Asteroids: Gunner was meant to be a challenging game, not just for single player action, but for competition among other gamer's online. Due to the age of the game, for this article we chose to bypass any online or social features of the game, and focus on the game play itself. When playing Asteroids: Gunner on default settings (shoot right), the virtual joystick at the bottom left of the screen controls the movement of the ship in all directions, as well as the speed, which is controlled by how far from the center radius you push the virtual joystick in any direction. The virtual joystick on the bottom right corner of the screen controls the direction of the gunners shots. If you choose to switch the controls, this can be done in the Options, by switching the Controls from Shoot Right to Shoot Left. Other options to change are Screen Shake on / off, music volume, and SFX volume. I personally found that the screen shake when the gunner is damages was giving me a headache, and that turning the option off was a far better experience. 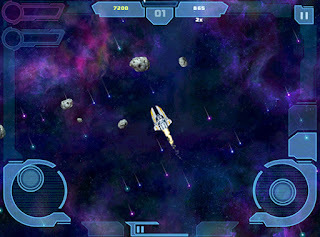 Asteroids: Gunner tests the gamer's hand eye coordination, as both hands are controlling the gunner and the shot direction simultaneously while asteroids as well as power ups are flying around the screen in all directions. Power ups will help you along the way by providing special weapon upgrades or health increases. As in the original Asteroids game, as you blast away at the larger asteroids, they break apart into smaller asteroids until you finally destroy the last spec of the asteroid. After destroying all the asteroids in each wave, search for the Wave Star and collect it to move on to the next wave. Each wave has special challenges which are displayed on the screen at the beginning of the wave, as well as a tip. Overall Asteroids: Gunner is a fun game once you get the controls down, and blasting through the waves of asteroids can definitely provide hours of entertainment. The visual theme of the game is a bit dark, and I personally would have preferred a brighter theme in the background, though the gunner as well as the asteroids look great on the iPad. I also thought the games music was a bit dark, and would prefer to blast asteroids to some EDM music, or something a little more upbeat, but the sound effects are perfect for the game. The game play and controls are smooth, and once I adjusted to the virtual joysticks, guiding the gunner, as well as the shot directions became much easier, allowing for the enjoyment of blasting wave after wave of asteroids. I enjoyed playing Asteroids: Gunner on the iPad and would rate this game as a "Recommended Game". Pro Tip: While the Super Shield is engaged, guide your gunner through as many larger asteroids as you can blasting them with the Super Shield. Pro Tip: If you find it hard to control the gunner in all directions at the same time as the directions of your shots, place the shots in one direction, and keep in in that directions, while navigating the gunner to aim at the asteroids. This makes it a little easier to blast the asteroids, until you settle in to the game play. Pro Tip: If you get caught in the middle of a large number of asteroids, stop your gunner and leave it in one spot while shooting the asteroids in all directions until you clear out some room to move.